It’s hardly surprising, as a self-confessed chocoholic, that I had very little awareness of what foods were good and bad for me growing up. Of course I knew the basics: meat and two veg, lots of fruit and vegetables and not much sugar right? But somehow the details of carbohydrates/proteins/calories/poly-unsaturated things all passed me by. I wouldn’t have been able to tell you for the life of me what was high in calories and what was basically ‘free’ from calories. Except maybe water, I knew water didn’t have calories. I also assumed that carbohydrates meant your basic staples: potatoes, bread, pasta, rice. I had no idea it extended beyond that. Now I’m almost 6’2″ and fairly slim so losing weight isn’t high on my agenda, but taking care of myself is. Feeling healthy, alert and like I’m treating my body well, impacts my mood and general outlook, so recently I’ve been finding out a little more about food. Being wheat-free has also meant that I’ve become far more aware of what is in what I eat as I have to check ingredients all the time to make sure they haven’t somehow snuck wheat in (you’d be amazed, it’s in so much)! Those of you who are already wheat-free will know that with this particular diet, similarly to many other intolerances, often comes a high price tag. But I’m starting to find ways to eat healthy, wheat-free, low-calorie foods for a reasonable cost so I thought I’d make a note of them in case, as is likely, I forget these little tips I’m learning. Here’s the fun one. I’ve only recently discovered that sandwiches are unnecessary calories, which isn’t so bad because gluten-free bread is not anything worth shouting about. Get rid of the bread but don’t get rid of the delicious and the filling. There’s no point in being hungry because if you’re anything like me, you’ll just keep snacking on whatever is close at hand. Here’s my plan: Salads, but not your traditional lettuce, cucumber and tomato (although sometimes they’re fine too). I’m more interested in quinoa, lentils, chickpeas, feta cheese, pomegranate seeds, sundried tomatoes, roasted courgette and pepper, sweetcorn, dried apricot and beetroot. You can pick and choose whichever of those you like the most and add in extras or change the basics but it’s healthy, it’s low calories, it’s wheat-free and it’s pretty cheap when you spread it out over a week of lunches. It’s also easy to get variety in there. I’m easily bored. I’m certainly not a vegetarian but most of the time I can give or take meat so we only have it once or twice a week and intersperse it with veg meals and fish (the cheaper fish types, rather than salmon or seabass despite our esteemed Prime Minister mistakenly believing the latter to be a modern staple of the society he governs). I also only have pasta about once a week, if at all. I’ve become more of a rice and potatoes girl. Lots of vegetables is crucial as they tick all boxes: they’re cheap, most of them are low in calories, they’re healthy, they’re filling and they’re naturally wheat-free! I have felt so much better since I switched to eating so much veg. Reasonable portion size – you always feel rubbish when you overeat anyway. Figure out how to tell the difference between hungry and thirsty – not as easy as you’d think. Don’t eat when you’re bored because you’re not really enjoying it anyway – I’m a sucker for eating a ridiculous amount of chocolate when I’m bored even if I’m not hungry. Don’t take the fun and yum out of food – I definitely haven’t cut out my chocolate, desserts and snacks. I eat little and often but I’m simply more aware of what it is that I’m snacking on, what actually fills me up and asking myself whether I really want what I’m eating. You don’t need to cut out on the fun stuff to eat healthily and cheaply. Vegetables fill you up and tick all important boxes. Eating fish at least once a week and meat a little less often really does make you feel better and saves the pennies. Lunch doesn’t have to be a monotonous calorific sandwich, nor the incredibly boring daily recurrence of soup. It can be fun and filling without being expensive. It’s all about the pulses and the variety. So. It turns out ‘meat and two veg’ and ‘lots of fruit and vegetables’ weren’t so far off the mark after all. My Christmas present for my sister was a joint present with three of her closest friends. 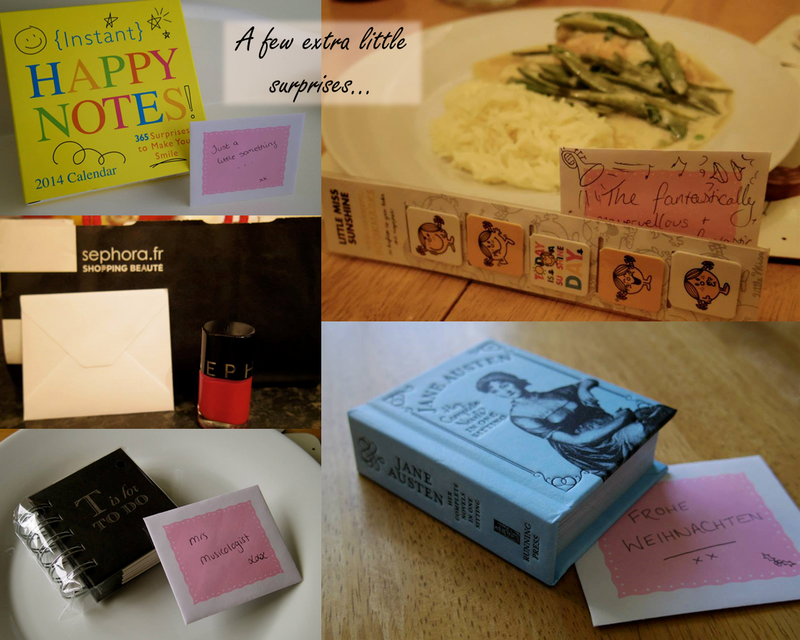 The aim was to whisk her away for a weekend to relax and, most importantly, stop working! We booked a cottage for the five of us and enjoyed an incredibly sunny couple of days along the coast in Hastings, Sussex. The cottage was just delightful, the location was amazing and the company was perfect for light-hearted laughter as well as deep and challenging late-night conversation. We even managed to sneak in a few extra surprises at every mealtime just so that my sister knew we had thought of her! I love that I get on so well with my sister’s friends as well as my own. It makes weekends like this all the more sweet.